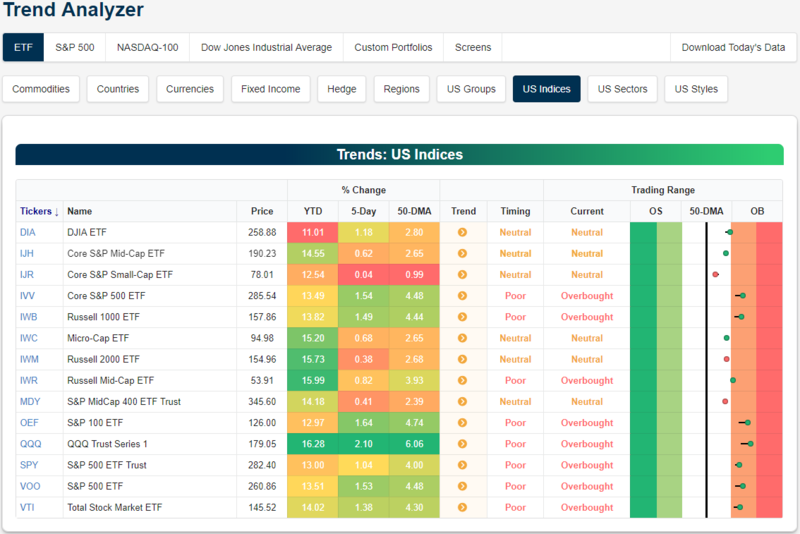 Below is a snapshot of US index ETFs pulled from our popular Trend Analyzer tool. Every ETF listed is up more than 10% YTD, and every one is above its 50-day moving average as well. Our proprietary “Trend” rating shows that they’re all in sideways trends, but they should start to flip to uptrends if the market can push a little higher over the next couple of weeks. Right now, the Nasdaq 100 ETF (QQQ) is the most overbought of the bunch, followed by the large-cap S&P 100 (OEF). The Core S&P Small-Cap ETF (IJR) is the closest to its 50-day moving average.